We are proud to be Kingston’s only not-for-profit dance school. In 1967, a community ballet association was formed to provide high-quality instruction to a small group of classical ballet students who were seeking excellence in technical training. In the past 50 years, the Kingston School of Dance has grown to be a vibrant, enthusiastic organization dedicated to enriching the community through dance. 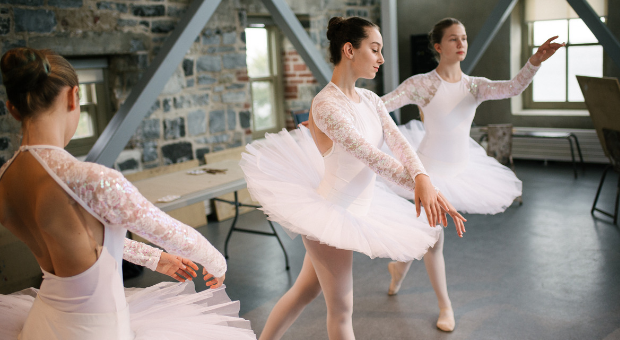 While we continue to provide the highest standard of classical ballet training, we offer a wide variety of dance genres for students, supporters, and spectators to experience. From western theatrical forms such as ballet, contemporary, jazz, and tap, to world rhythms, hip-hop, and Acrobatic Arts, we are proud to share our passion for dance to the community. We strive to provide affordable and accessible programming to our dancers. We cultivate a nurturing environment where students can discover their unique and innate ability to dance. Dancers ranging from 3 to 80 years of age experience an exciting and current curriculum. Whether a student's goal is to become a professional dancer, find an enjoyable recreational outlet, or improve fitness, our teaching faculty are dedicated to their individual development. We provide sound technical training while encouraging fun and creative exploration. Our adult programs are constantly expanding. We currently offer a wide range of dance classes for adults including; Ballet, Repertoire, Contemporary, Latin Fusion, Barre-Burn, Step, Heels, Salsa, World Rhythms and Tap. Lunch hour drop-in classes run from Tuesdays to Fridays. Please consult our website for more information. At K.S.D. we recognize that each dancer is unique. We are proud to be an inclusive organization that welcomes students with exceptionalities. We believe that the ability to dance has no limitations. Discover the joy of dance this summer! No previous dance experience neccessary. Bring your dance technique and performance to the next level this summer.